Ontario’s Drive Clean Emissions Test: Why and How Often? Leading the initiative on climate change, Ontario is the only Province with mandatory emissions testing. 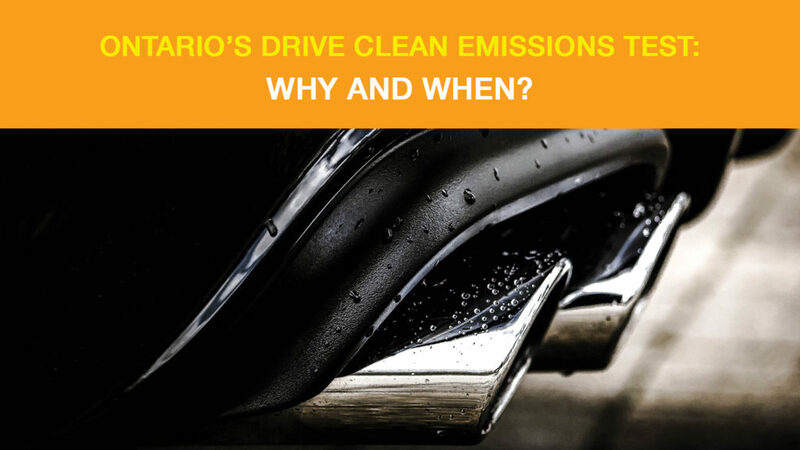 The Drive Clean Program was first implemented in 1999 as a preventative means to help eliminate harmful emissions and improve Ontario’s air quality. Keeping our air clean is vital in combating climate change and helps improve the overall health of everyone in Ontario. Children with asthma, those suffering from allergies, the elderly, and anyone living with respiratory illnesses are especially at risk from smog caused by car pollutants. Does Drive Clean Make A Difference? Yes, it does! The vehicles we drive release smog-causing pollutants and other toxic contaminants into the air we breathe. According to the Ontario Medical Association, smog contributes to about 9,500 premature deaths each year in Ontario alone. Since it was first implemented 19 years ago, the Drive Clean program is credited with preventing 400,000 tonnes of pollutants from making their way into the air we breathe. You Need a Drive Clean Test, but How Often? Most vehicles seven years and older require a Drive Clean test at the time of their registration renewal. How frequently depends on the size of your vehicle. The good news is, you will receive a registration renewal notice either online or in the mail to let you know your vehicle is due for an emissions test. Vehicles on the road that are over seven years old, and weigh 4,500 kilograms or less, require a Drive Clean test every two years to renew their registration. If you own a car, van, SUV, light truck or motorhome, you likely fall into this category. Selling or buying a used car? As of April 1, 2017, you no longer require a Drive Clean test to transfer ownership when buying a used vehicle! Vehicles with a registered gross weight over 4,500 kilograms that are seven years and older require an annual Drive Clean test to renew their registration. Selling your truck or motorhome? Unlike their light-duty counterparts, heavy-duty vehicles that aren’t the current model year require a Drive Clean pass to transfer ownership. You May Not Need A Drive Clean Test! Beginning April 1st, 2017, Ontario eliminated the $30 Drive Clean test fee for light-duty vehicles, which includes most cars, vans, SUVs and light trucks. You’ll still need to pay for the repairs required if you do not pass–up to $450 to receive a conditional pass–as well as a retest fee. Still not sure if you’re due for a Drive Clean test? For more information on emission testing or to schedule maintenance,contact your local Master Mechanic with any questions or concerns! < Ask A Master Mechanic: What Side Is My Gas Tank On?